This kitchen has been designed to be the hub of the home. As a space where this family intended to spend much of their time, we wanted the kitchen to be as beautiful as it was functional. 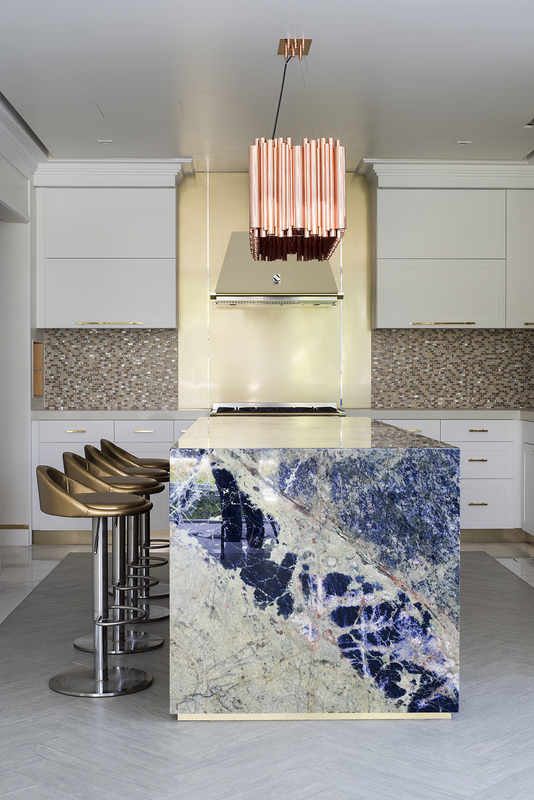 We selected a vibrant blue heavily-veined granite for the island top. It provides a show-stopping focal point and a visual anchor to the space. 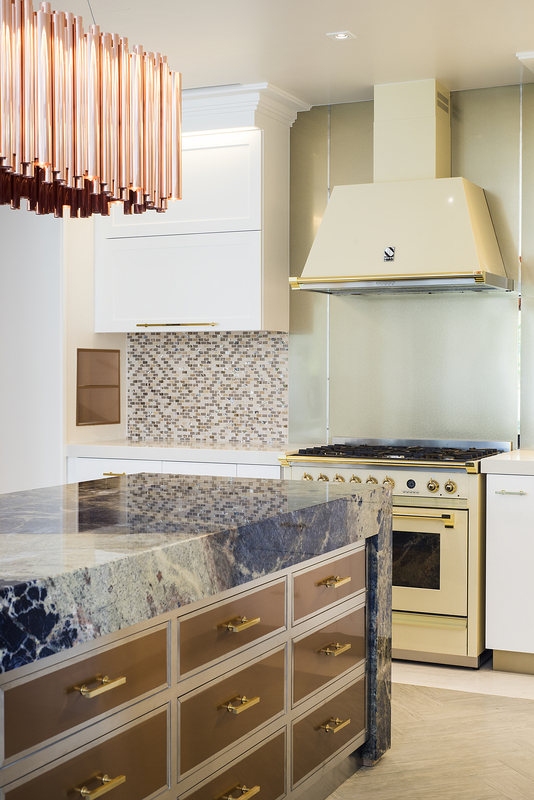 In addition to the polished steel and gold accents that we have used in the rest of the home, we have introduced a third metal element: in this kitchen, we combined copper, polished steel and gold tones for a thoroughly, fresh and unique kitchen. Positioning cupboards with glass door fronts in front of a window ensure the kitchen enjoys an abundance of natural light. A relaxed family-friendly dining area has been set into the back corner of the kitchen; a perfect corner for the family to enjoy a relaxed meal together or for kids to do homework while mum and dad cook. 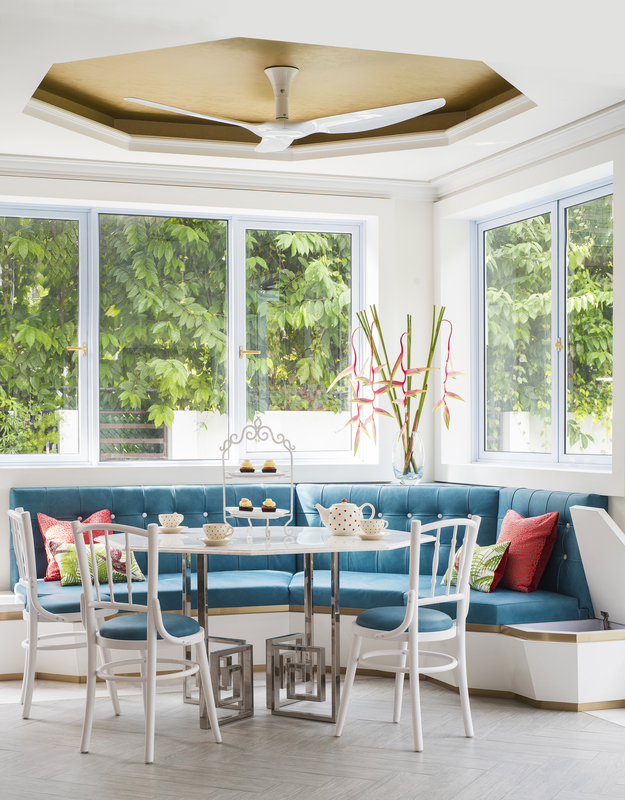 The faceted edges and gold inset skirting trim around the base of the banquette integrates the design with the rest of the home. We chose a teal blue leather, that is easy to wipe clean. The colour is reflected in many of the art pieces. White button detail, adds a crispness and echoes the buttoned dining chairs in the formal dining areas. Side tables either end of the banquette, lift up to reveal valuable storage. They conceal charging stations for electrical devices. The Stools upholstered in bronze leather are easy to wipe clean but are eminently glamorous. 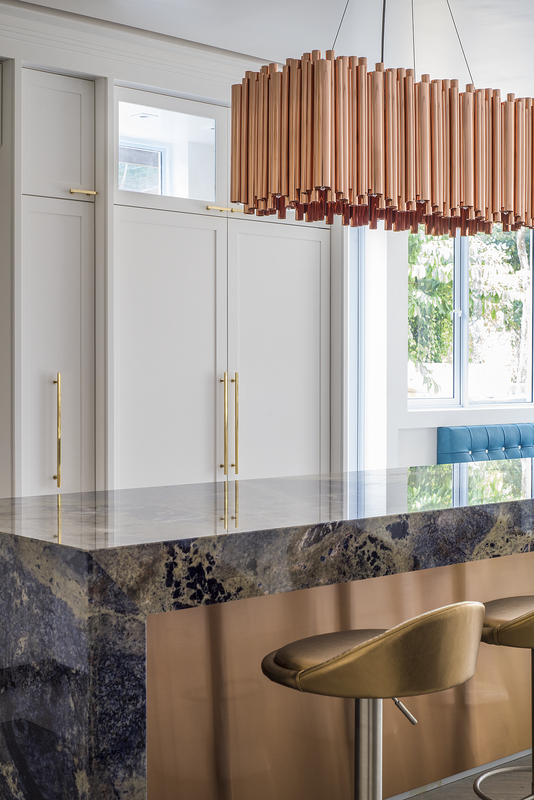 Together with this stunning copper pendant, they ensure this family-friendly kitchen resonates with a glamour that matches the rest of the home. The Bistro Table base is repeated from the entrance for a cohesive feel between the open plan spaces. Instead of glass, this time the table top is made of marble. It is an octagonal slab, identical to the ones we have used for the flooring in the living & formal dining areas, visually integrating the spaces and repeating the use of an eight-sided shape- bringing luck into the heart of the home. A mosaic backsplash in blush tones accentuates the copper elements and the rose tones in the granite slab. 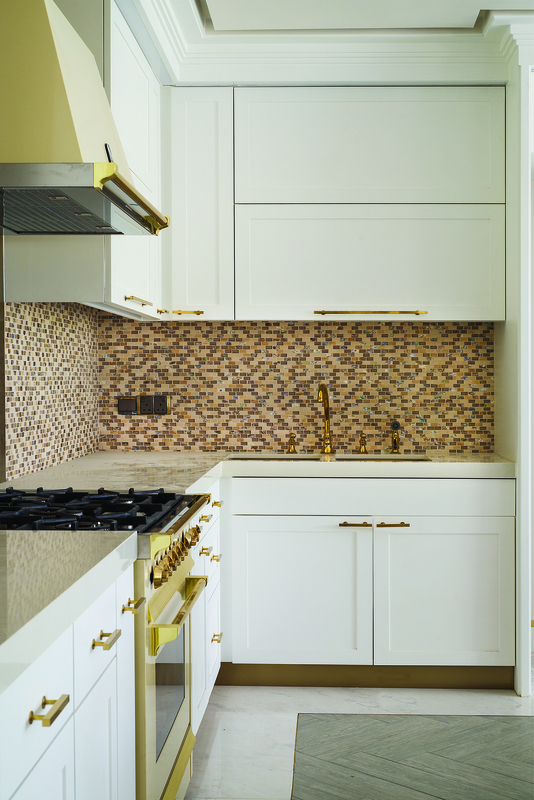 Gold hardware keeps the look glamorous, linking the kitchen with the rest of the interiors. The rose tone of the copper adds warmth to the space and a visual connection to the coral tones used in adjacent rooms. Trimming copper-fronted doors in steel has allowed us to integrate stainless steel appliances seamlessly into the design. Cool, calm and purpled up!